I grew up in London but I’ve always wanted to learn to surf. My Dad gave surfing a go when I was a kiddie and I can remember being fascinated by it. I came to Oz travelling on a 3-month trip in Jan 2010 and told my family “I’m going to Australia to learn to surf with the dolphins”! My first ever surf was up in Port Macquarie on a beach with no-one around. I didn’t realise at the time how precious those quiet surfs are but I did know from day one that I loved it. 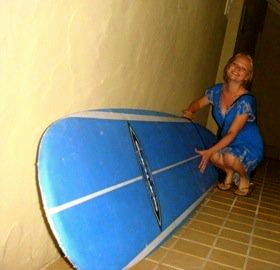 I could barely even paddle without falling off the 7’4” mini mal (and not much has changed since!) but I threw myself into every wave and eventually started to catch a few. After my 3-months were up I’d totally fallen in love with Oz and the ocean, so I missed my flight home with no money, no home and no job… best decision I’ve ever made! Since then I’ve lived in Manly and now Bondi so quiet surfs are most definitely a thing of the past. But I’m trying to get out of the city as much as possible to avoid crowded waves. What I love about surfing: Just being out in the ocean… I always think that sitting in a line-up’s like being part of an exclusive playground that only a privileged few get to play in. There’s something about paddling out at the crack of dawn and watching the sun rise over the water that makes me smile like nothing else. I’ve surfed on and off since I started and I’m still useless!! But like a friend once said to me… The best surfer in the water is the one with the biggest smile on their face, which makes me a pro!! 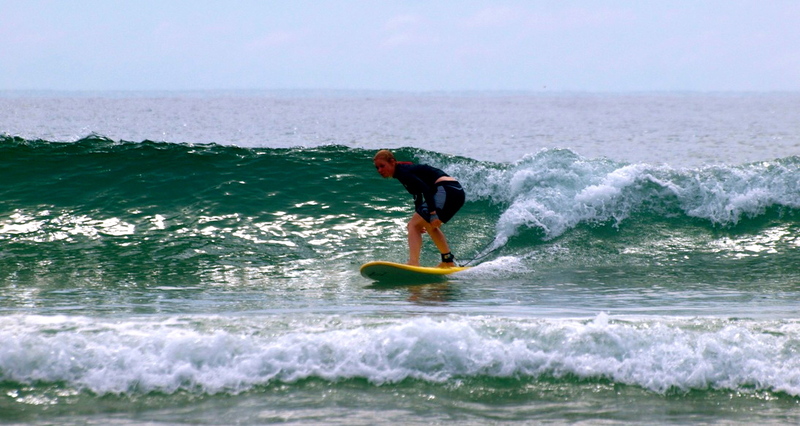 What I hate about surfing: That it’s not like riding a bike! I’ve gone through phases since I started of going obsessively and then stopping for months. Just recently I’ve started to get back into it and it’s like going back to square one. Back to getting smashed even in tiny surf, nose-diving and struggling to catch a wave. I know it’s only a matter of time before it all clicks again though… and I can’t wait! Favourite surfspot in Oz: Beach 1, Seal Rocks – nice gentle little rolling beginner waves. Or The Pass in Byron. Favourite surfspot overseas: I’ve never surfed outside Oz but I’m heading to Bali later in the year so we’ll see! Favourite surf movie: Is it too cheesy to say Point Break?! Haha! But it’s true!